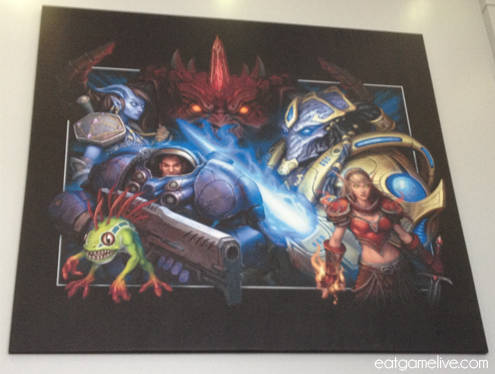 BlizzCon 2013 Wrap Up & Blizzard HQ Tour! During the past weekend, the boyfriend and I made the ~7 hour long drive from chilly San Francisco to sunny Anaheim for BlizzCon 2013! It was a tiring drive, but we immediately felt rejuvenated when we saw the convention center. We arrived the following morning at around 8:00 AM, checked into our hotel, and rushed to the convention center to pick up our tickets and swag. By the time we got to the main entrance of the convention center, there was a massive Horde of people! OK, really, there was a hoard, but I couldn’t pass up making that silly pun considering how much Horde representation amassed outside. But don’t worry, the Alliance was there in full force too. 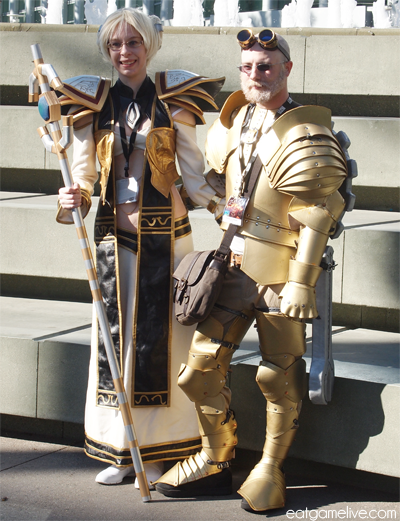 Cosplayers were showing off their amazing creations inside and outside of the convention hall. Of course, many photographers flocked to take pictures of their lovely costumes. Unfortunately, I neglected to get some of the names of these talented cosplayers — so if you know who they are, please let me know. I’d like to give credit where credit is due! Just chillin’ in front of the fountain, waitin’ for quests. There were a ton more cosplayers, but I didn’t have a chance to snag their photos! When the clock struck 11:00 AM on Friday morning, it was all time to pile up at the main stage to enjoy the opening ceremony. Thousands of people were seated in the main hall, with thousands more standing in the back. Everyone seemed to have that same look in their eye — the sort of sparkle that you see when someone realizes that the moment they’ve been waiting for is finally upon them. Just a small portion of the enormous crowd. It was very obvious that the entire room was holding back their excitement. And then, it happened. 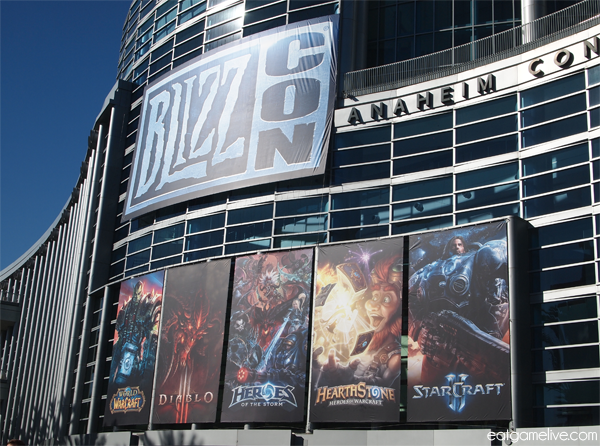 The lights dimmed and a voice boomed over the speaker — Welcome to BlizzCon 2013. A proud roar erupted from the crowd, followed by clapping and cheers. When the trailers for the upcoming games came about, the crowd became even more chaotic and ecstatic. It was all so unreal. All these tens of thousands of people converging in this building for just video games? But it’s just not about the games, it’s about the community too and that’s what’s so great about it. Don’t mind me… I’m just a gigantic orc on a wolf. 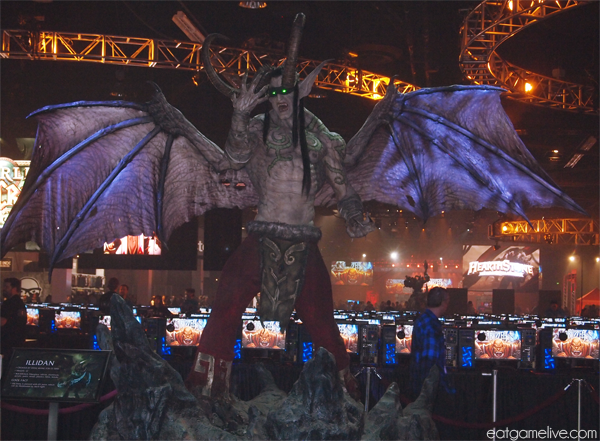 After emerging from the main hall, we flocked towards the Diablo III Reaper of Souls area. Of course I was super hyped to play a demo of the upcoming expansion. I will admit I am super biased and ran towards the PC version first. The PlayStation 4 version looks beautiful, but I think I will sticking with my little Demon Hunter on PC. BUT IT’S REALLY TEMPTING TO GET BOTH, OK? I played a little Adventure Mode and incredibly seamless. I like that you can go to any way point without having to return to your character selection screen and switch between acts. The upcoming Bounty system will also give out extra bonuses (and even legendaries) for completing simple tasks like killing X amount of a certain type of demon. I didn’t even notice I was doing a bounty because I was busy KILLING ALL THE THINGS BECAUSE THAT’S YOU DO IN DIABLO! 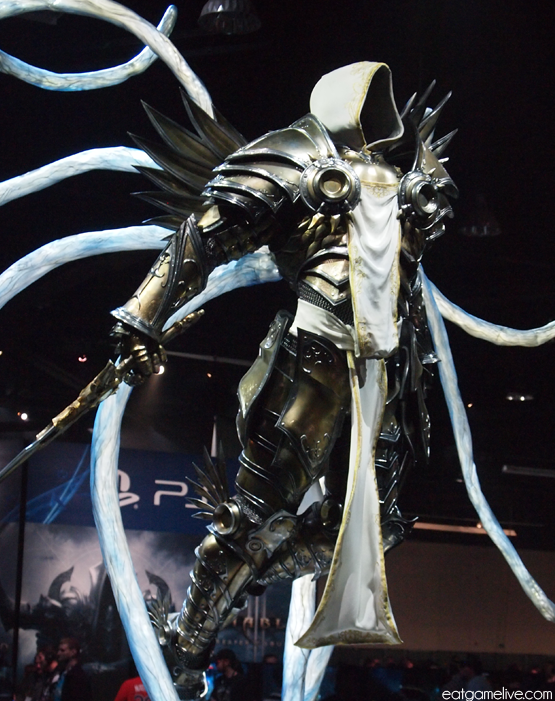 Wow Tyrael, you’re looking good. Do you like, uh, work out? When we finished our RoS demos, we walked over to the Heroes of the Storm demo. The wait for the game was incredibly short, but as more peoples’ curiosity peaked, the wait times for the game increased. I chose to play as Valla the Demon Hunter because I’m biased and because someone else chose Nova. The boyfriend, keeping up with the theme, chose Tyrael. As a team, we basically rocked top lane. However, the game did end in a draw because we ran out of time before we could kill the enemy base. I did have a lot of fun playing and both teams were very friendly with each other. We exchanged GG brofists. Hooray good sportsmanship! I had fun playing Heroes of the Storm. I have some experience playing games of that genre, so the controls for Heroes of the Storm were not very difficult to grasp. However, the build we were playing was considered an alpha build, so there’s likely to be a TON of changes before this game is even closed to open beta. At that point, I don’t know if I can properly assess Heroes of the Storm. It’s not a finished game, and it wouldn’t be fair to say it’s good or bad until you sit down and play at least a beta product. For it’s current state, it is definitely a good time killer. Will it be a LoL killer? I don’t know yet. During the talks, the devs made it obvious that they did not want to call Heroes of the Storm a “moba”, a term coined by Riot. They definitely want to make that solid distinction that Heroes of the Storm was not your run-of-the-mill moba, but rather, it was a “hero brawler”. A few years ago, watching other people play games competitively was a completely new concept to me. My boyfriend introduced me to the StarCraft II competitive scene and I quickly got hooked. And now, almost three years later, I find myself swooning over the StarCraft II pros who roll onto the stage like rockstars. But it’s just not StarCraft II, I’ve grown to admire other celebrities that have sprung up from Diablo III and now Hearthstone (though many are former celebrities from other games). I was incredibly excited to watch both the Hearthstone Inn Keeper’s Invitational tournament and the StarCraft II WCS, so I planned my days around those two events. I got my Hearthstone fix by playing in the community tournament and going 3-0 with a pre-made priest deck. Not too shabby, right? I really wish I could play with my constructed rogue deck though! When we finished messing around in the community arena, we watched the part of the Ro8 for the Inn Keeper’s Invitational at the Hearthstone area. I had originally guessed that Day9 would make it to the semi-finals, but unfortunately, he went 1-3 against Reckful. However, I was excited to hear that the Mayor of Value Town, Trump, made it on and was expected to play against Artosis. Dang, what a match! 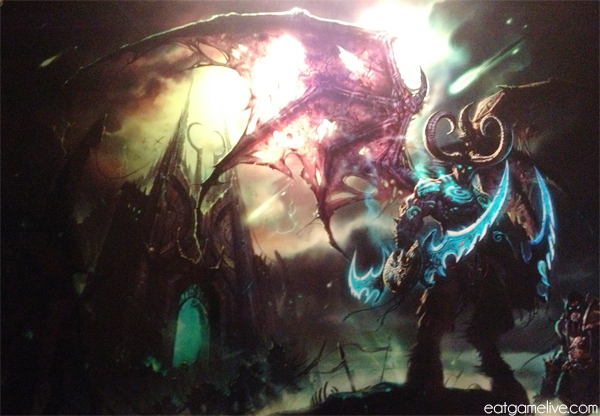 We ended day 1 of BlizzCon by playing the demo for the new WoW expansion. I have never played WoW in my life, but I am familiar with MMOs (most of the MMOs I played were just copies of WoW anyway…). Who knows? Maybe I’ll start a WoW account when the next expansion comes out since I won’t have to worry about all the content I missed since vanilla. Maybe. The following day was the start of the Inn Keeper’s Invitational semi-finals with Artosis vs Trump and Kripparrian vs Reckful. We met up with fellow CSL admin/graphic designer, Elliot, and one of his guildmates from WoW. Luckily, we had pretty prime seats and we could clearly see the tension building on stage. To make things more exciting, I brought glow sticks (of course I would do this)! Hooray! 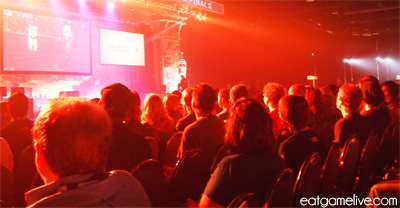 So we all quietly glowed as we watched everyone battle to the death on stage. Artosis explains his strategies during the matches. 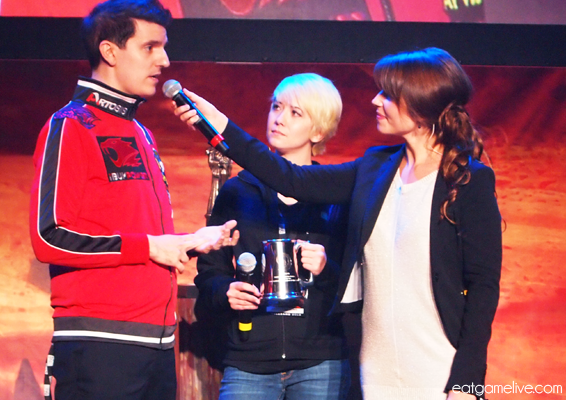 The finals match between Artosis and Kripparrian was pretty nail bitingly close. In the final tie-breaker match, Artosis had three minions on the board — one of which was a Leper Gnome. The Leper Gnome is a 1 mana cost 2/1 (2 attack, 1 heath) card that deals 2 damage to the enemy hero when he is killed/destroyed. At this point of the game, Kripparrian only had 2 health. If he killed the Leper Gnome, he would die, if he didn’t kill the Leper Gnome, he would die to the 2 damage. That basically sealed his fate and he ended up using Blizzard, a card which deals 2 damage to all enemy minions and freezes them, in order to end the game. Though there are already a few Hearthstone tournaments online, such as the Managrind tournament, it was nice to see a tournament on a grand stage. Hearthstone is still in closed beta, so I’m sure that once the game is released (preferably with spectator mode), the tournament scene will begin to flourish. StarCraft II will always have a special place in my heart. I’m sure I’ve mentioned this before, but StarCraft II was my first Blizzard game. Yeah, I know, I’m a tad bit late. I quickly became involved in StarCraft II and the community and soon joined forces with the Collegiate StarLeague and met some amazing people from around the country. I never thought I would attend a huge StarCraft II tournament. I’ve attended an IPL event before, but that was a rather small scale tournament compared to this. 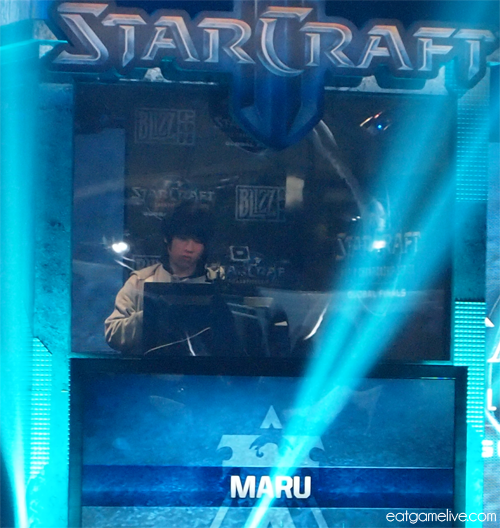 Maru prepares for his next match. 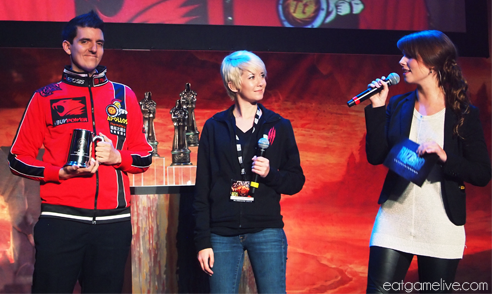 The last day of BlizzCon was the WCS finals, I was flaunting a Terran shirt. Surely, either Maru or Bomber were going to make it to the finals, right? NOPE. PROTOSS AND ZERG ONLY. I was a little sad, but it’s OK, I found another Terran supporter (with the same shirt) and we bro-fisted. We terrans gotta stay together. I had a chance to meet up with a few other CSL admins during the WCS finals, such as Duran “Xeris” Parsi and Daniil “CheeseHeadLogic” Pauley. The area was packed, but Daniil was nice enough to save us a few seats. The brothers, Sean “Day” Plott and Nick “Tasteless” Plott, prepare to cast. Before the finals between Jaedong and sOs, we were being showered with gifts from the WCS staff. T-shirts, thunder sticks, and WCS card packs were being thrown left and right towards a sea of raised hands that were hoping to catch a souvenir or two. I was able to snag a shirt, but convention t-shirts are always a miss for me. I’m a very tiny person, so it’s very rare that I manage to get a coveted XS or S shirt. This time was no different — I managed to catch an XL “I <3 SC” shirt. I passed the shirt along to Daniil, and I guess good karma paid off because a few moments later, Elliot caught a medium-sized Kerrigan shirt and passed it to my boyfriend. It all worked out! When the finals began, everyone in the crowd was cheering for Jaedong. 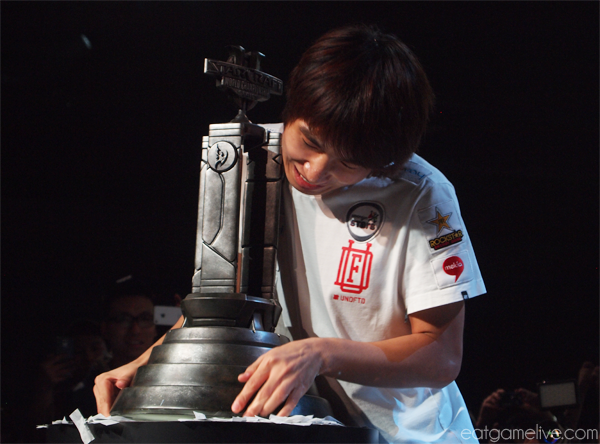 I really wanted Jaedong to win — he’s one of the few Zergs I cheer for. Unfortunately, it didn’t turn out that way and sOs dominated. sOs had pretty flawless play, and Jaedong just couldn’t keep up with it. When Protoss gets to the ball of death stage, it’s terrifying. The trophy is super heavy. 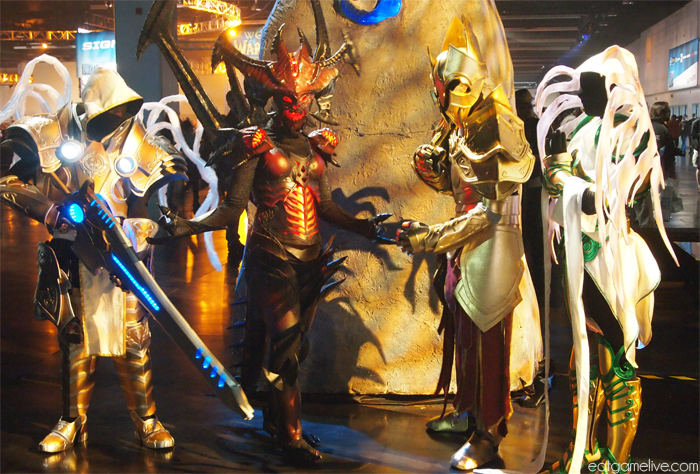 When I finally brushed off all the confetti from the WCS finals, I wandered over to the community corner to speak with some of the Diablo III community managers. There, I was met with Vaeflare, Lylirra, and Nevalistis. They, as well as the other CMs chillin at the booth, were all super sweet and tolerated my incredible nerd freak out moments. 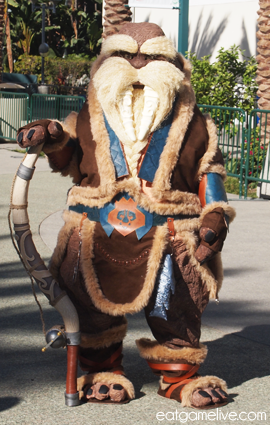 Ahhhh I’m at Blizzcon this is overwhelming what is going on help. But then, suddenly, a wild Wyatt Cheng appeared and he was soon swarmed by folks from r/Diablo, BlizzPro, and other community sites. Even TwitchTV Moldran was there to listen to Wyatt’s stories. We kind of enclosed Wyatt in a circle of Diablo III nerdiness — NO ESCAPE! It was great listening to his design philosophies for things such as damage output, survivability, and certain skills. Eventually, the circle had to end because security made us leave since it was 10:00 PM. ahhh welp. I managed to catch up with Wyatt a little bit and we talked about food. So yes, a Reapers of Soul recipe will be coming soon. When we finally returned to our hotel after BlizzCon, it was time to finally rest. There were after parties happening, but neither my boyfriend nor I were really up for partying. 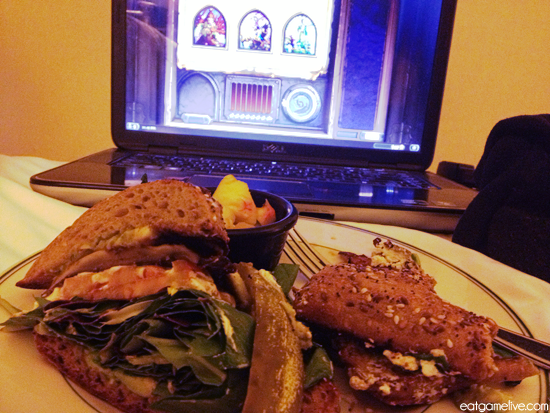 So we busted out our laptops, ordered room service, and played Hearthstone until it was time to pass out. 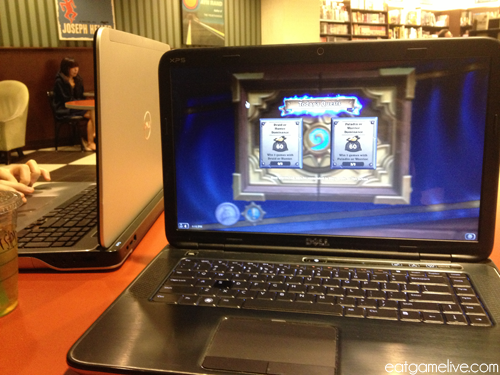 Yes, we both paid $10 for internet to play Hearthstone. That’s a portobello mushroom burger at the Sheraton. I also forgot to eat most of it because I was playing Arena. Overall, I had a blast at my first BlizzCon! I had a chance to meet some friends that I’ve only known from online and I got to play some exciting new games. I’ve been to many many gaming conventions before, such as PAX East, E3 and GDC, but BlizzCon is unlike any other gaming event I’ve ever attended. It’s two days of non-stop action and honestly, I was surprisingly overwhelmed by it all. I expected BlizzCon to be much less organized than it actually was — I expected there to be periods of lull, but there was always something to do. There were always games to play, people to meet, developers to speak with, cosplay to admire, games to watch, and things to buy. Honestly, the lines for food were significantly longer than the lines to play the games. Each playable game had hundreds of computers lined up and ready for demos. It was all shockingly efficient! 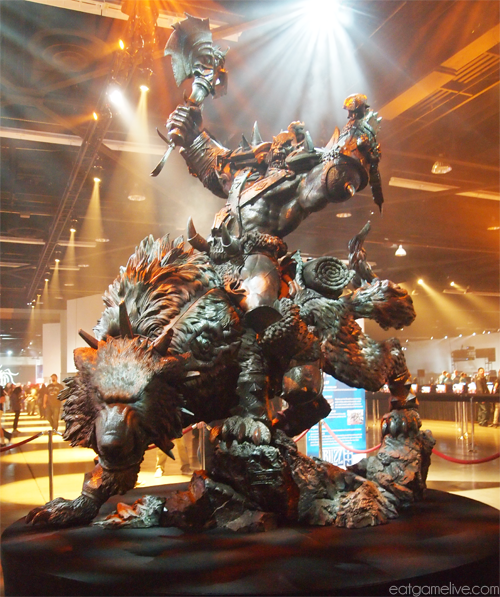 I hope I have the opportunity to attend BlizzCon 2014. I’ll remember to take more pictures and organize my meet-up schedule better next time. We didn’t check out Blink-182 from the main stage because we were too busy preventing Wyatt Cheng from escaping listening to Wyatt Cheng’s stories. 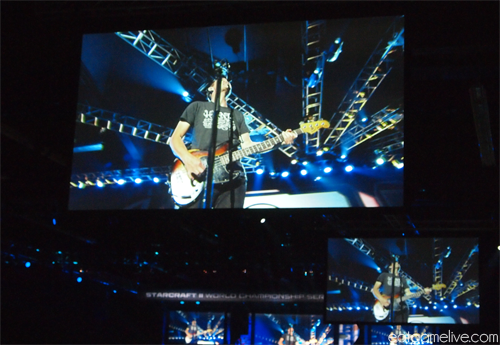 Thankfully, there’s lots of giant monitors to watch throughout the convention hall! 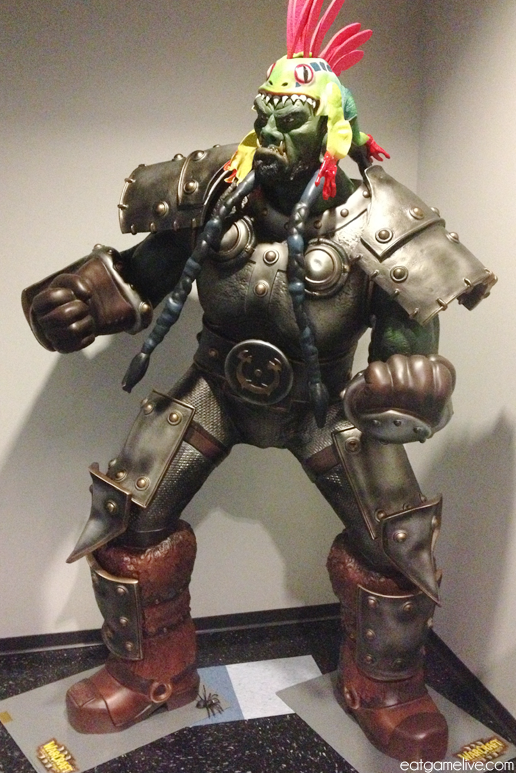 The next morning, we checked out and prepared for our next adventure: a tour of Blizzard HQ! A few months ago, Vaeflare reached out to me about a possible tour of Blizzard HQ. Of course I accepted it. We decided that if time permitted, a tour on the Sunday after BlizzCon would probably work best. The Sunday after Blizzcon, we packed all of our belongings and checked out of our hotel. Since it was so early, we decided to head to the Irvine Spectrum to kill time before our Blizzard HQ tour. By kill time, I mean we just found a place with Wi-Fi and played Hearthstone. ahhhhh can’t stop, won’t stop. After a few games, it was time to head over to Blizzard HQ. After getting approved by security, we were greeted by Vaeflare and her friends in the visitor parking lot. The first thing we saw was the cafeteria where Blizzard employees get to purchase delicious snacks. Of course, since it was Sunday (and right after BlizzCon), it was closed. The entire campus was pretty empty since everyone was recovering from BlizzCon, but, there were still some people in their offices getting work done. We didn’t tour any of the development areas since they were all behind closed doors (and for good reason too — don’t want to ruin any surprises), but there was still a lot of interesting stuff to admire. During our tour, we also checked out the Blizzard Academy where Blizzard employees get to work on their art in their free time. There’s classes on Maya, sculpting, and other things. Artwork from these classes are displayed throughout the buildings. We also had a chance to check out the Blizzard library. It’s a cool little room full of novels, instructional books, tabletop games, consoles and games. Yes, I said consoles AND games. The room felt very cozy, and I could see people losing hours upon hours playing D&D or Warhammer or something on the big table in the center of the room. 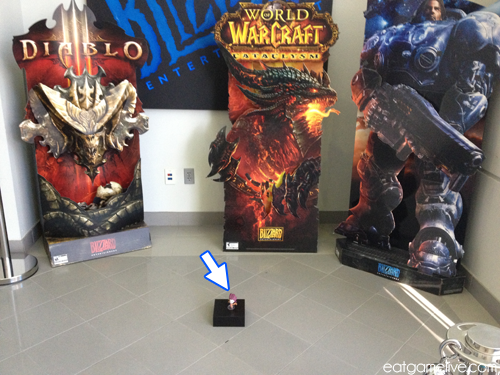 When we walked by Diablo III development offices and I got to see how cool their card reader is! It’s Diablo’s head and the eyes are lit by the card scanner, so I guess if you work in that department, you can smack Diablo in the face every time you need to get into the office. I wish I could have that as my doorbell, but I don’t think my apartment managers would be too pleased about me changing my doorbell to Diablo’s face. I’m pretty sure that my void my deposit too… Hmm. The long hallways were covered with familiar faces like Jim Raynor, the Butcher, and Illidan Stormwind. I would probably hang this in my house. There were even storyboard concepts from the original World of Warcraft trailer, and original sketches of Kerrigan from the first StarCraft artfully scribbled on crinkled and worn paper hung proudly in the halls. Even original concept sketches from Chris Metzen himself decorated the walls. Ok, I’m not entirely sure if the Murloc hat is a Halloween costume or if it’s his regular outfit. There was another Thrall I saw with a championship wrestling belt and a sweet sombrero. I can always appreciate a sweet sombrero. Vaeflare also informed us that there was a Thrall who was sporting a Nicolas Cage mask somewhere in the facility… Thankfully, we didn’t see it on our tour, but it sounds like that would be awful and terrifying. I don’t want more nightmares! Since most of the statues (Kerrigan, Tyrael, Illidan, Raynor, etc.) were still at BlizzCon, they had stand-ins back at the office. Wow Kerrigan, you uh, you look, different. We finished our tour in the main lobby where you can check out the theater or look at the constructed StarCraft II: Heart of the Swarm display. I didn’t manage to take many photos of that because my phone was completely dead (/sadtrombone), but I can assure you, it was pretty damn cool. There were development videos of maps and of the HotS trailer and tons of lore, including Kerrigan’s history. One of the cutest things I saw was this big album of fan letters sitting in the waiting area of the lobby. I popped it open and glanced through all of the letters, drawings, and wedding invites sent to Blizzard over the years. There were crayon drawings for proposed “StarCraft 3″ units and peoples’ WoW characters, all were extremely adorable. I even a school report where the sender created a poll at his school to find out what types of games people played. The sender even sent in pie-charts and data to back up his report. It was all freaking adorable. 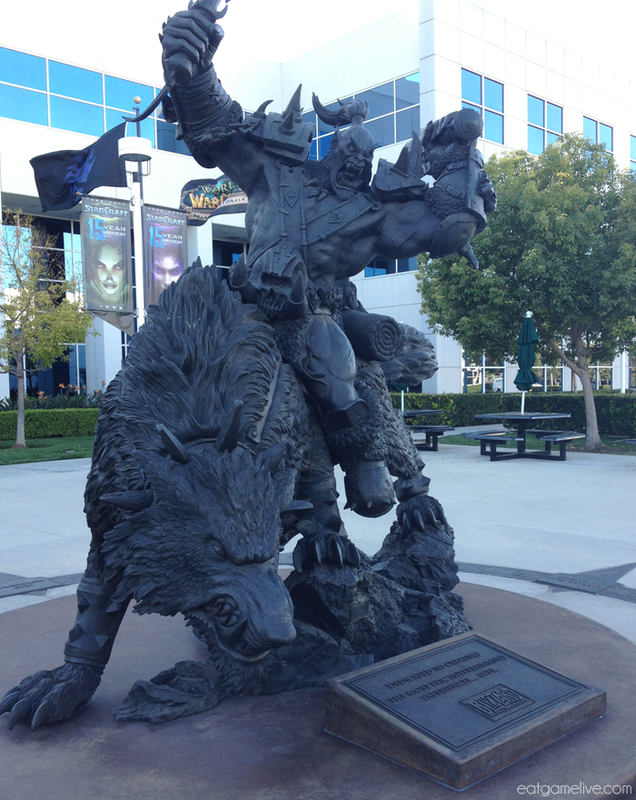 I enjoyed touring the Blizzard campus and checking out where some of my favorite games are developed and tested. So I must give a gigantic thank you to Vaeflare for taking the time to give us a tour. 😀 It was a lot of fun and I hope one day I can come back to see all the other cool stuff in the office. Basically, if I could tl;dr this entire post, I would just say I had an incredible time hanging out with people in Anaheim and playing video games. Wheeeeeeeeeeeeeeeeeee! of Duty franchise that’s has over 100 million players worldwide.